A memorial service was held on Saturday at the Unitarian Chapel in Newington Green, in London, for Christopher Keith Hall who died on 27 May of cancer at the age of 66. 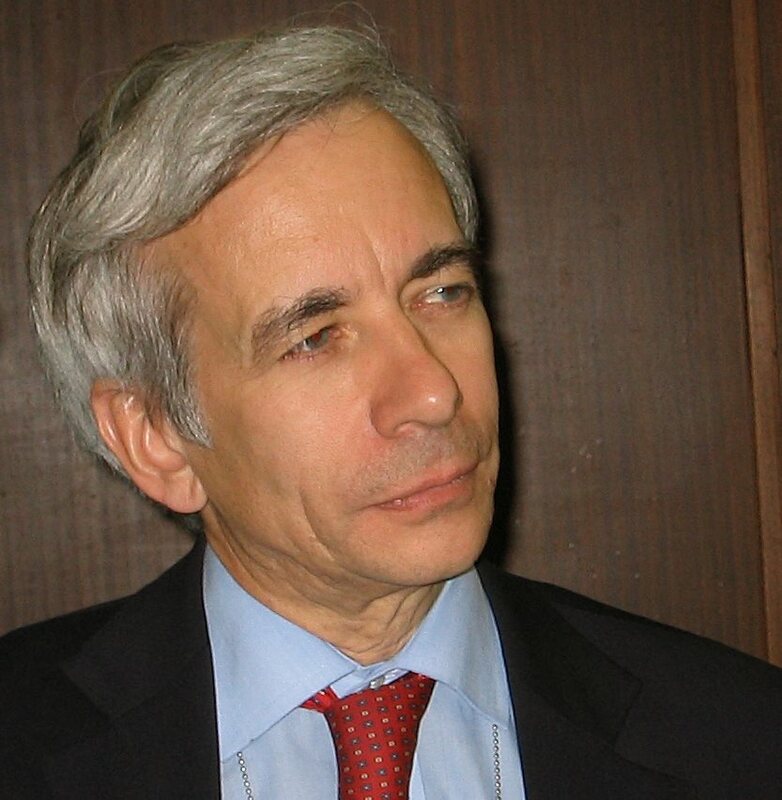 Christopher was a legal adviser to the International Secretarial of Amnesty International for more than twenty years. He played a very prominent role in Amnesty’s campaign for the International Criminal Court. 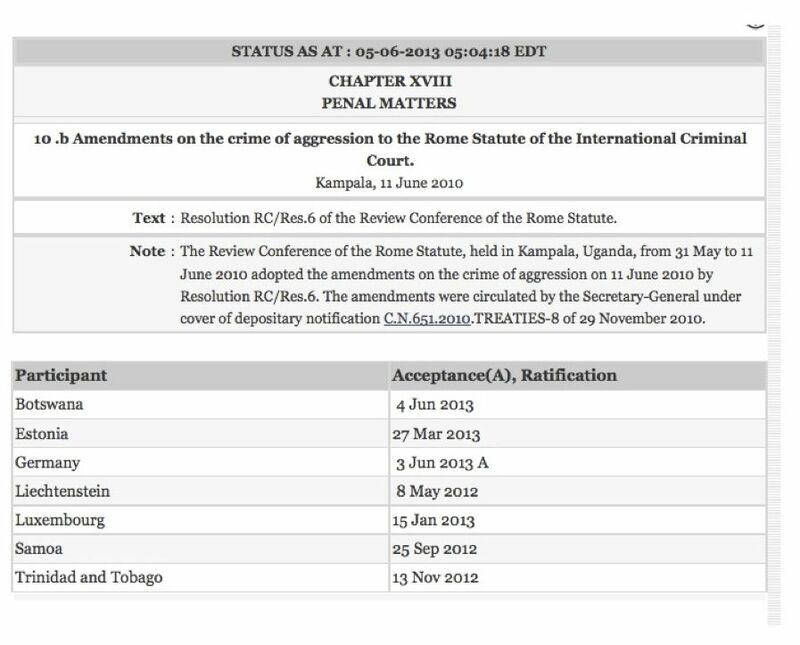 Christopher participated in the Rome Conference and must have been present at virtually every significant gathering about the International Criminal Court since about 1995. He made an immense contribution and his loss is greatly felt by his many friends and colleagues, among whom I count myself. Christopher and I first met in 1995 at a debriefing for the Amnesty International International Secretariat on the hearing of the South African Constitutional Court in the Makwenyane case, which led to judicial abolition of the death penalty and which I attended on behalf of the organisation. We worked together often over the years. In the buildup to the Rome Conference, Christopher wrote a series of policy papers, entitled ‘Making the Right Choices’, that did a huge amount to frame the debate during the negotiations. He was regularly sought out by the diplomatic participants because of his enormous grasp of the legal issues. But his expertise, which all acknowleged, was constantly informed by his commitment to fundamental human rights. Many of his old friends from Amnesty International were present at the London service yesterday. Ian Martin, Nigel Rodley and Wilder Tayler all spoke eloquently about his work and fondly about his friendship. (See also Nigel Rodley’s obituary in the Guardian). Our condolences go to his family, and especially to his wife Françoise and his two young children, Olivia and Catriona. Human Rights Watch reports that President Obama, on his visit today to Senegal, praised the establishment of the Extraordinary African Chambers earlier this year and said that the United States would provide financial support. The establishment of the Chambers was a response to the judgment of the International Court of Justice, in a case filed by Belgium, that last July found Senegal to be in breach of the Torture Convention for its failure to prosecute or extradite Hissène Habré, the former dictator of Chad. While the prosecution of Habré is commendable, the whole business shows the hypocrisy of some of the supporters of international criminal justice. Among the most shocking examples of torture over the past decade are those attributable to the United States, at Abu Ghraib, in Afghanistan and at Guantanamo. Like Senegal, the United States is a party to the Torture Convention. Belgium was keen enough to go after Senegal but why is it not as aggressive when it comes to the United States? Instead of praising the United States for its endorsement of the Habré proceedings and its pledge of assistance, we should be reminding the world of the double standards that are at work. No wonder so many Africans ask questions about the validity of the international justice project. University of Copenhagen: 3-year post-doctoral fellowship: Europe and New Global Challenges (EuroChallenge). The postdoctoral fellowship is hosted by the iCourts Centre of Excellence in the Faculty of Law. "EuroChallenge" is a major new interdisciplinary project, financed by the University´s 2016 strategic funding initiative. It addresses key questions about the place of Europe in the context of a rapidly and radically changing global order. The project is a collaborative venture, involving three faculties (Social Science, Law and Humanities). It is organized into three work packages. One postdoctoral fellow will be recruited to each of the work packages. The advertisement is HERE. The University of Copenhagen is seeking to hire a Professor in International Law, with a specific focus on international courts. The professor will be affiliated with iCourts – The Danish National Research Foundation’s Centre of Excellence for International Courts, which is a research center at the Faculty of Law. The advertisement is HERE. The Antonio Cassese Initiative has received an una tantum donation from the ‘Stichting Praemium Erasmianum’. This foundation aims to strengthen the position of the humanities, the social sciences and the arts. Every year the foundation awards the Erasmus Prize, intended for persons or institutions that have made an exceptional contribution to culture in Europe. In 2009, Antonio Cassese received the Erasmus Prize for his significant contribution to the development of a universal system of law and for motivating a great number of student and collaborators in his function as judge, scholar, teacher and critic.Therefore, to continue his legacy, the Initiative has decided to use the donation to motivate students and young professionals to take part in the development of international law by writing a paper on new perspectives in international criminal law. Oxford University Press has kindly accepted to contribute to the Prize with a donation in books. For more information about the Prize and the call for papers, please click here. Yet another prosecution before the International Criminal Court is in trouble. Pre-Trial Chamber I has ruled that in the case against Laurent Gbagbo, the former president of the Côte d’Ivoire, the evidence is insufficient to satisfy the requirements of article 61 of the Statute. That provision applies to the confirmation hearing stage. It is a form of preliminary hearing at which the Pre-Trial Chamber must determine that there are ‘substantial grounds’ for a finding of criminal responsibility. The Pre-Trial Chamber was not unanimous. Judges Kaul and Van den Wyngaert were in the majority. Judge Fernández dissented. The majority said that although the evidence presented by the Prosecutor was insufficient, it ‘does not appear to be so lacking in relevance and probative value that it leaves the Chamber with no choice but to decline to confirm the charges’. The hearing has been suspended and a detailed request for additional evidence given to the Prosecutor. The majority judges noted that most of the allegations had been proven ‘solely with anonymous hearsay from NGO Reports, United Nations reports and press articles’ and it said it was ‘unable to attribute much probative value to these materials’. One concern raised by the majority judges was the prejudice to the right of the accused to speedy trial. The proceedings have been underway for 18 months already and the trial has yet to begin. But taking into account all of the circumstances, the judges did not feel any particular action was required at this point. This is the fifteenth case to go to the confirmation hearing stage since the Court began proceedings in 2006. Four have already been rejected and this case may become the fifth. Another case that passed the confirmation hearing stage was withdrawn at the request of the Prosecutor. Of the two that have reached the verdict stage, there has been one acquittal. Could it be that the judges of the Pre-Trial Chamber feel the Prosecutor’s cases are not, as a general rule, properly prepared. Maybe this is meant as a signal. The judges are offering a helping hand to a Prosecutor who is struggling. It seems almost trite to recall the symbolic importance of Germany's accession to the amendments. This is the State blamed at Nuremberg for the most destructive acts of aggression in human history. Now it takes the lead as a peacemaker. 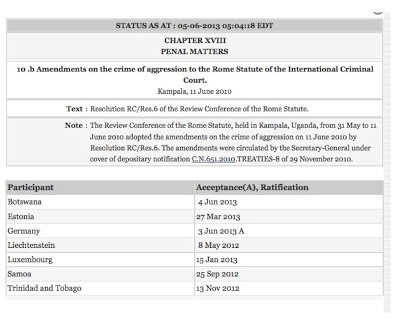 Thirty ratifications are required for the entry into force of the amendments. They cannot enter into force until 2017 in any event. The pace of ratification is accelerating slowly and the 2017 target seems realistic. There will probably be some attempts to obstruct this by the United States but its effectiveness is hampered by the fact that it has not joined the Court. The final condition for entry into force is a resolution of the Assembly of States Parties. But if the thirty ratifications are obtained, a resolution can hardly be a major obstacle. What Happened to the International Criminal Tribunal for the former Yugoslavia? Several recent decisions of the International Criminal Tribunal for the former Yugoslavia have court-watchers scratching their heads. What seemed until a year or two ago to be a fairly consistent narrative of the conflicts and a coherent vision that was uncompromising in attaching liability for atrocities at the highest level seems to have shifted. There is a very stimulating op-ed by Eric Gordy in Monday's New York Times on the subject. Libya’s challenge to the admissibility of the proceedings against Seif Al-Islam Gaddafi has been rejected by Pre-Trial Chamber I in an important decision interpreting article 17 of the Rome Statute. In a unanimous decision, the Chamber pointed to several factors in support of its view that Libya was not able to investigate or prosecute the Gaddafi case. Consequently, the proceedings before the International Criminal Court should continue and Gaddafi is required to be transferred to The Hague. The decision is available here.